This Calvin and Hobbes couple costume was a great costume for my boyfriend and I to don on Halloween and for my boyfriend to try out as his first home-made costume! Calvin (Me): I colored a red shirt with sharpie to make the stripes, wore black shorts and a backpack I already had, and dyed white ked-like sneakers red for the shoes! I give, I had to buy the wig but I did spray it with a yellow paint to make it more cartoon like! Buy a white sweatshirt and sweatpants (we just went toGoodwill) and dye them orange. Attach black tape to the sleeves, torso, and pants to make the stripes. You can use sharpie but since there are so many stripes, but I liked the tapes already straight lines and rich color. The Sharpie can just soak right into the fabric! Take an old towel (the whiter the better) and divide it into two pieces hamburger-style. Cut one piece into an arch-like shape and glue to the sweatshirt for Hobbes’ fuzzy belly. Once my boyfriend did this, he really saw the costume coming together and got so excited! Take the other half of the towel and roll hot dog-style (so it’s long). 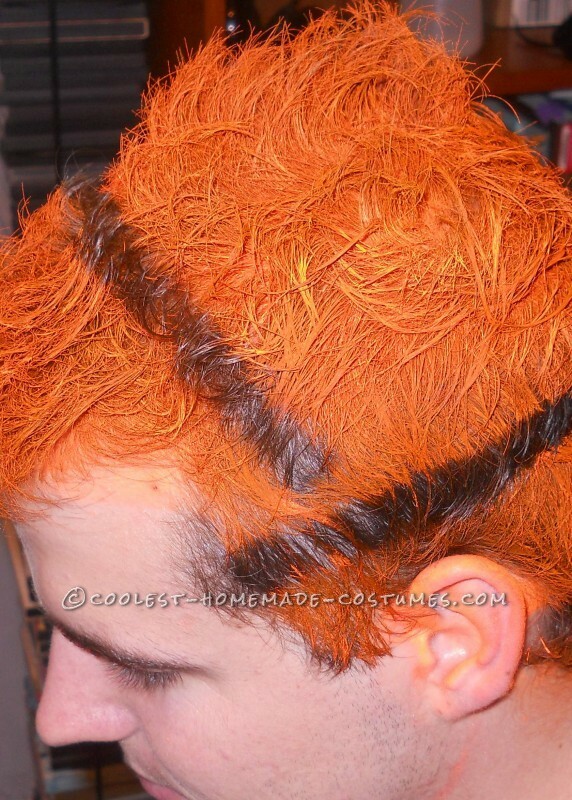 Glue the open seam closed, and dye it the same orange as the sweatsuit. Attach more black tape to the tail for stripes and pin it to the pants with a safety pin. I pinned it from the inside of the pants. The tail was without a doubt my boyfriend’s most favorite part of the costume, he played with it all night! Wear fuzzy white slippers for the feet! To finish it, glue black and white felt to a headband that matches your Hobbes’ hair style. For fun, we gently placed tape in our Hobbes’ hair, sprayed orange, and removed the tape for cool stripes built in to the hair! My boyfriend had never had a cool home-made costume before, and I DID start him with a more labor-intensive one but the proud look on his face when he was done spoke volumes! The greatest things about this costume was it brought us together during the fabricating process, exercised our creative muscles, got GREAT reactions from friends and family, and has both visual and texture appeal!